A Christmas card sent to Olive, Clair, and Little Clair Smith from friends in Iowa, Leona and Burton. 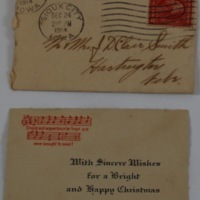 It was postmarked 24 December 1914 at 2:30 PM in Sioux City, Iowa. 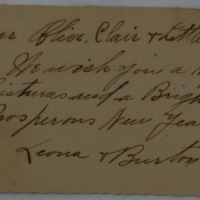 “Christmas Card from Leona and Burton to Olive, Clair, and Little Clair Smith,” History Harvest, accessed April 21, 2019, https://historyharvest.unl.edu/items/show/627.